When you are rigging down tree limbs or chunking down a tree, you may have loads weighing several hundred pounds exerting thousands of pounds of force on your rigging rope. A strong, reliable line is crucial, and we stock a wide range of high-quality tree rigging ropes so that you can find exactly the right bull line for your job. Need advice on selecting the right rigging rope? Feel free to contact us online or call for a recommendation. Never mix your personal climbing rope and your rigging rope! Please note that all rope measurements from the manufacturer are plus or minus 5%. 12-strand, super-light, cable-replacing Samson winch line. 12-strand, Samson rigging line is durable and resists snagging. 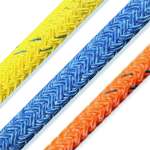 Double-braid, Sterling rope built for maximum shock absorption. Double-braid, Yale rigging line is high-strength and low stretch. 12-strand, easy-to-splice, affordable rigging line. Double-braid, Samson rigging line with increased energy absorption. Double-braid, Yale rigging line with added energy absorption. 3-strand, Samson rigging line; inexpensive and easy to handle. 3-strand, hard-lay Samson rigging line; super-strong and durable. Double-braid, Teufelberger rigging rope with built-in overload indicators. Double-braid, Samson rigging rope; premium, best-selling rigging line. 12-strand, easily-spliced Samson rope for winch lines. 12-strand, easily-spliced Samson rope is the go-to rope for rigging slings. Rope, slings, block and Port-A-Wrap III for a ready to go rigging solution.